While the BYU basketball team was sweating out an unprecedented 25-point comeback Tuesday to play into the NCAA basketball tournament, I couldn't help but think that they wouldn't have this sort of problem had Jimmer stuck around for an unprecedented fifth-year. Fredette's exploits at BYU were so legendary that he probably created a run on the name Jimmer among Mormon families. Shoot, if we'd had a son born last year at this time, you can be sure there would be a Jimmer Van De Graaff crawling around right now. For the fourth consecutive year, I'll be running basketball-themed gags for the next three weeks to correspond to the NCAA tournament. It's a good thing ward basketball provides a never ending source of humor. Are you sick of my rambling posts and wish that there was a way to just get the gags without any of my commentary (please don't answer this in the comments section), well now you can! Introducing LDS Laughs: the Mormon Cartoonist app for your iPhone and iPad! LDS Laughs provides you with nearly every Comic of the Week since the inception of this blog in an easy to scroll through format. The app is produced by my good friends at LDS Mobile Apps whose LDS Coloring Book you really should have purchased by now* and I couldn't be more pleased with it. Best of all, the app is free! Please download it now (and don't forget to write a glowing customer review afterwords), you won't be sorry. *I've contributed over a half-dozen 12-page coloring books for the LDS Coloring Book app. The app itself comes with two coloring books for $0.99 after which you can either subscribe for $0.99 a month to receive a new coloring book every month or you can pay $0.99 for each additional coloring book your interested in. Hilton Campbell at LDS Mobile Apps has done an incredible job with the coloring book app. It's better than anything else on the market. Great name choice in the gag above! I thought you'd like that. 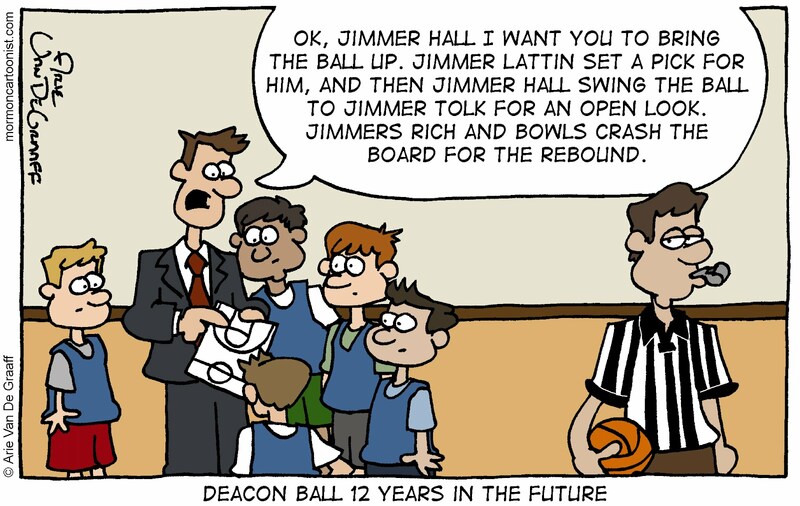 You might want to consider the name Jimmer for your first born son. Incredibly cool app -- I've already got it downloaded and refer to it often! Thanks, Kevin. My app with its meager 160 gags would pale in comparison to a Beckstrom Buzz app. With your volume of gags, we'll probable have to wait for the iPad 4 before we have a tablet with enough memory to run it! If that is 12 years in the future, shouldn't all the kids be wearing jet propelled shoes and like shiny futuristic clothes and crazy sunglasses visor thingys. I'm just saying, that's probably how people will look in the future. You did it Arie! 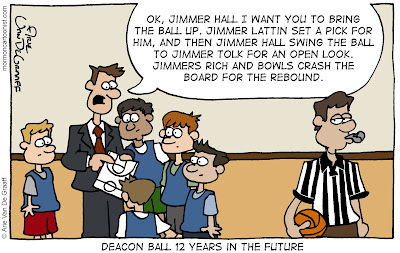 You found a way to incorporate this Jimmer gag into your blog! (remember the convo you, Eric, and I had about not being able to use it because BYU didn't make it as far as you had hoped last year in the tournament?) Joel, according to Back to the Future 2, we should all be on hover boards right now so I can't imagine what exciting inventions await us 12 years into the future. I'm just hoping that General Conference might find its way into the Church of Basketball. Elder Holland's talk in Priesthood session covered that!